Neurotransmitter: a chemical involved in communicating a chemical signal from one neuron (brain cell) to another. Many of these changes appear to be due to oxidative processes, which are chemical changes that occur as a result of exposure to radiation, toxins, environmental factors, and naturally occurring chemicals. Oxidative processes are a natural part of aging, and contribute to many of the effects of aging (both in and outside the brain), including cancer and other diseases. Changes in brain function (and other body functions) due to oxidative processes become more pronounced with increasing age because oxidative changes accumulate over time, and because advancing age is associated with a decline in the body’s antioxidant systems . Researchers have long known that consumption of antioxidant chemical-containing foods is beneficial in staving off the oxidation-related effects of aging. While many fruits and vegetables are good sources of antioxidant chemicals, berries are a particularly rich source of a class of antioxidant chemicals called anthocyanins . A new review of studies suggests that mounting evidence supports consumption of berries to help maintain brain function with age . The review authors note that there is in vitro evidence to support berry consumption for brain health. Examples include studies that show constituents of berries affect neuronal signaling and neurotransmitter production [6-8]. As for in vivo evidence, aging rats fed berries on a routine basis showed improved memory  and improved recognition of a new object . 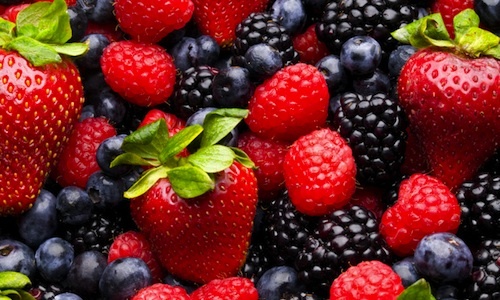 The anti-inflammatory properties of berries have been replicated in vivo , and berries have been demonstrated to reduce neuronal atrophy in aging rats . Clinical evidence in humans is also beginning to accumulate, though research on the effects of berries on the aging human brain is not yet conclusive. Nevertheless, given that berries are a healthy component of diet aside from any potential anti-aging properties they might possess (they’re high in vitamin C and certain minerals, including selenium), a risk-to-benefit analysis supports incorporating berries into the diet on a regular basis. Verhaeghen et al. Aging, executive control, and attention: a review of meta-analyses. Neurosci Biobehav Rev. 2002 Nov;26(7):849-57. Seidler et al. Motor control and aging: links to age-related brain structural, functional, and biochemical effects. Neurosci Biobehav Rev. 2010 Apr;34(5):721-33. Epub 2009 Oct 20. Sohal et al. Oxidative stress, caloric restriction, and aging. Science. 1996 Jul 5;273(5271):59-63. Winkel-Shirley, B. Biosynthesis of flavonoids and effects of stress. Curr Opin Plant Biol. 2002 Jun;5(3):218-23. Miller et al. Berry Fruit Enhances Beneficial Signaling in the Brain. J Agric Food Chem. 2012 Feb 3. [Epub ahead of print]. Dreiseitel et al. Berry anthocyanins and their aglycons inhibit monoamine oxidases A and B. Pharmacol Res. 2009 May;59(5):306-11. Epub 2009 Feb 5. Joseph et al. The m3 muscarinic receptor i3 domain confers oxidative stress protection on calcium regulation in transfected cos-7 cells. Aging Cell. 2004 Oct;3(5):263-71. Kim et al. Mulberry fruit protects dopaminergic neurons in toxin-induced Parkinson’s disease models. Br J Nutr. 2010 Jul;104(1):8-16. Epub 2010 Feb 26. Shukitt-Hale et al. The effects of grape juice on cognitive and motor deficits in aging. Nutrition. 2006 Mar;22(3):295-302. Epub 2006 Jan 18. Goyarzu et al. Blueberry supplemented diet: effects on object recognition memory and nuclear factor-kB levels in aged rats. Nutr Neurosci. 2004 Apr;7(2):75-83. Ueda et al. Glutamate excess and free radical formation during and following kainic acid-induced status epilepticus. Exp Brain Res. 2002 Nov;147(2):219-26. Epub 2002 Sep 25. Shih et al. Antioxidant and cognitive promotion effects of anthocyanin-rich mulberry (Morus atropurpurea L.) on senescence-accelerated mice and prevention of Alzheimer’s disease. J Nutr Biochem. 2010 Jul;21(7):598-605. Epub 2009 May 14.